Review written by and copyright: Eric Cotenas (24th March 2019). 2163 A.D.: Ikarie XB-1 is not just a spaceship, it's a "cosmic town of forty people" on a journey out of our solar system to explore the Alpha Centauri system not just for a planet capable of sustaining life but for one in which they expect that life has indeed developed intelligently. Although the journey will last fifteen Earth years, only twenty-eight months will have elapsed on the ship due to time delineation. Not only does the crew have to deal emotionally with the reality that their loved ones will have aged significantly upon their return (one man whose pregnant wife had to stay on Earth will not get to meet his daughter until she is a teenager), but they also find that the passage of time accelerates in their interpersonal relationships on board as friendships and love affairs come and go quickly (with the older crew members viewing them on surveillance monitors like a soap opera), and popular hangouts are soon abandoned as if their interest has waned over years. As they drift further away from the Earth and into the other star system, they start to encounter the unknown, from an alien vessel to the bizarre, narcoleptic, paranoid, and physically harmful effects of a close encounter with a "dark star" that threatens their very sanity and possibly their survival. 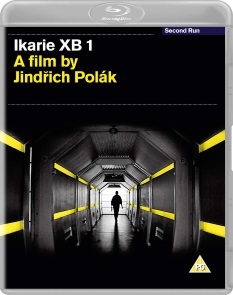 Based on an early novel by Stanislaw Lem - author of Solaris (adapted by Andrei Tarkovsky and later Steven Soderbergh and unofficially as Event Horizon) - Ikarie XB 1 is an exquisite piece of Eastern European science fiction (so much so that the film was only re-edited by American International for its U.S. release of Voyage to the End of the Universe whereas some of their Soviet sci-fi pick-ups were salvaged only for their special effects shots with new stories and footage shot around them like Planeta Bur and The Sky Calls) although the American version did alter the ending in a manner to anticipates the conclusion of the AIP co-production Planet of the Vampires. The visual effects, set design, and performances are all of a high caliber, but it is the film's attention to the human aspect of the story that is most impressive. The interactions are sometimes immediate and emotional, and sometimes observed from a distance to surreal effect (if Fellini made a science fiction movie, he too would have indulged in such a rigidly choreographed, almost courtly, discotheque sequence and several of the dashing pans and tracking shots of twisted faces rushing towards the camera). That it lacks a spectacular laser battle ending is of little importance when the spirit of collaboration and cooperation - that made the exploratory journey to connect with other life in the galaxy rather than to salvage resources possible in the first place - is at stake. Released in the US and the UK in American International's edited, slightly altered 70m cut as Voyage to the End of the Universe, Ikarie XB 1 was difficult to see in its complete form, and even the AIP version was most accessible a 16mm cropped television print on grey market videocassette. When the film was restored to its original Czech mono audio and scope dimensions, it was first issued in the Czech Republic from Filmexport and then in Italy from NoShame, with both editions including English subtitles for the feature. More accessible would be Second Run's 2013 DVD on which they performed some additional work on the SD PAL master and created exclusive extras. Second Run's 2019 Blu-ray is derived from a 4K restoration created in 2017 from the original camera negative and sound elements. Despite a degree of softness inherent in the anamorphic photography, blacks are deeper and the greys reveal more shades in the production design and wardrobes, while what once looked like solid blocks of color in the walls of the ship now also reveal textures which may or may not have been intended to be seen. Some of the shadows in the interior of the ship seem a bit lighter than one imagines they should be, but the outer space scenes and the interiors of the dead ship sport inkier blacks that suggest the former was not a fault of the materials or the digital grading. The original Czech mono audio is presented in LPCM 2.0 and is as clean as the DVD audio. The more subtle parts of the film's score may seem more prominent, but this may be a subjective opinion based on a casual comparison. Optional English subtitles are provided. Ported over from the DVD is An Appreciation by critic Kim Newman (12:00) in which he suggests that Russia beating America into space lead to an approach in science fiction film of exploration rather than invasion. New to this release is director Jindrich Polák short film "The Most Ordinary of Occupations [Nejv edn j í povolání]" (1963; 12:24) as well as the Alternative US version "Voyage to the End of the Universe" Opening (4:00) and the Alternative US version "Voyage to the End of the Universe" End Scene (1:09) taken from a VHS source with the title sequence squeezed to keep the credits and the action in the frame. Also new are a 2016 Restoration Trailer (1:54) and the "Voyage to the End of the Universe" Theatrical Trailer (2:01), and a Photo Gallery (0:55). Unlike other Second Run Blu-rays, the special features menu here is unclearly highlighted and I actually stumbled upon the disc's Easter Egg accidentally. Highlight the photo gallery option and then arrow left for an extract of Second Run's Mehelli Modi discussing Ikarie XB 1 (14:30) from the Barbican Film Podcast. Also included is a twenty-page booklet featuring a substantial essay by writer and film historian Michael Brooke in which he provides an overview of Eastern European science fiction from the twenties to the sixties, an analysis of the film, as well as some detail about the changes imposed on the film for its US release through American International (including the removal of anti-American/anti-capitalist references). He also mentions that Stanley Kubrick only thought the film was only "a half step up from your average science fiction film" even though the film's influence is felt throughout 2001. It is identical to the nineteen-page DVD booklet apart from some additional restoration credits with the smaller size of the Blu-ray booklet requiring a different typesetting of the text. Second Run's Blu-ray of the 4K restoration of Ikarie XB 1 offers new viewers a chance to rediscover the neglected strain of humanist science fiction.